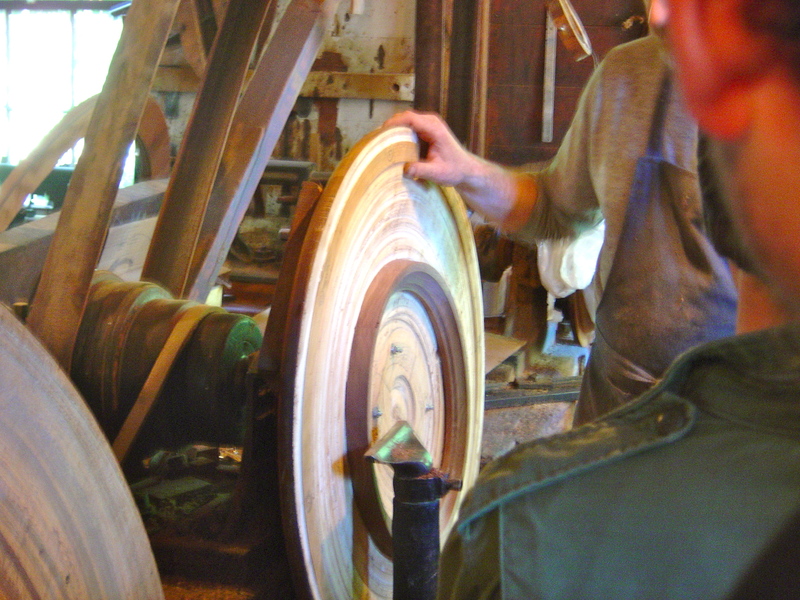 If you’re an avid wood turner and live in or near New England this is a road trip worth taking. The Old Schwamb Mill in Arlington MA (a short 1 block walk from the North Bennet Street School’s Arlington campus — and on the road to historic Lexington where I lived for a long time) is a great afternoon trip and the sort of place you could drive by every day and never notice — as I did for years. Once discovered, this site is a real gem, and also home to a Shaker furniture and supply store. The magic is in the head stock — one of only a handful of this 100+ year old design known to still exist. And there are 3 or 4 of them at the mill. As the head turns there is a mechanical movement that moves the piece being turned up and down so that the wood is consistently presented to the tool at the tool rest. It also makes for a rhythmic noise as it runs. It’s not like most turning — think of it like scraping with style. The mill has been at this location for 300+ years and making world famous oval frames for 137+ years. In addition to the lathe shown here there is also a massive version in the basement along with several other unique belt driven tools which expedited the process of making and joining these interesting frames. Work from this mill is in the White House and other similar places around the world.